Despite my best attempts, I was unable to take them swimming as much as I and certainly they wanted. Nor were we able to get to an amusement park or visit our good friends in Alabama. But, one of the great benefits of homeschooling is that we can still do some of those things later in the year. I took a hardcover book I picked up about family treasures and started to capture the memories from different relatives about our ancestors. Then, we can continue our genealogical studies when we return home. I will involve our children as much as possible in the planning stage for the year and solicit suggestions from them of new things to do and others to be discontinued. Even if you intend to cover numerous subjects choose a few and begin with those first. Then, add another to the schedule over the next few days or weeks. Also, consider having a great “send-off” or bash at the start of the new session. We have a fun day of assigning new books and supplies and setting up our space at the start of our new season. And, sometimes we even conclude with root beer floats at home or a run to Sonic during their half-price hours! In our home, we have discovered that separate zones tend to work best for us. All of my teacher’s editions, answer keys, and homeschooling helps books are kept in a separate area. I keep puzzles, Bingo games, Tangrams, Math-U-See blocks, Legos, and other games on a low bookcase that our children can easily reach. Each activity is kept in a clear, plastic tub that is labeled or has a photo of what is inside. But, my favorite area and the one that requires the most of my attention is my homeschool materials cabinet shown here. 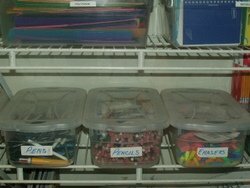 I have all our wire notebooks, composition books, glue sticks, pens, pencils, erasers, paint, and other supplies in this cabinet. The children have access to everything kept here and also required to help keep this area neat and tidy whenever it needs it.